Family members and friends arriving with the coffin at Our Lady of Lourdes church on Sean McDermott Street for the funeral of gangland murder victim Derek Coakley Hutch. 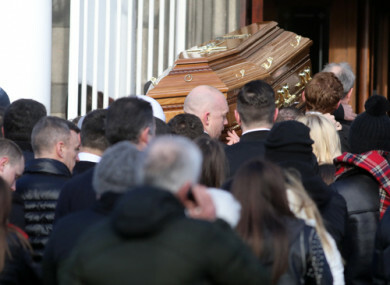 A PRIEST HAS condemned the ongoing gangland violence in Dublin in a strong homily delivered at the funeral of murdered gang member Derek Hutch. 27-year-old Derek Coakley Hutch was shot at the Bridgeview halting site near Cloverhill Road, Dublin, on Saturday 20 January. A nephew of Gerry “The Monk” Hutch, Derek became the latest victim of the ongoing feud between the Kinahan and Hutch gangs. The feud has claimed 14 lives so far. Speaking at Hutch’s funeral mass at Our Lady of Lourdes Church, Sean McDermott Street, this morning, Father Michael Casey condemned the killing and those who carried it out. “The shocking, barbaric, violent, cowardly act of the killing of Derek, fondly known as Delboy, last Saturday week and the consequent havoc, pain, suffering and devastation that the family and indeed larger community must endure is wrong, pointless and without justification,” Casey said. “This reign of violence and total disrespect for human life carried out by people who have become soulless is frightening and leaves us all vulnerable. This spiral of violence, revenge, retaliation and the ensnarement of many in this web of what can only be described as evil has led to the destruction of the most precious gift – that of life itself and our call to be human. The priest said that although Hutch’s “living remains lay before us” his spirit was free “because he was loved and loved”. “Those with hardened closed hearts have cut themselves of from life’s source, which is compassion, forgiveness, being reconciled. They have become living dead,” the priest said. They and their actions and the dark world they inhabit has no place in this sacred place nor indeed in this community. ‘Thou shall not kill’ remains, ‘thou shall not kill’. The priest expressed sympathy with Hutch’s family. “That is why our concern, our thoughts, actions, are with Delboy’s mam Noleen who grieves the death of her beloved son, of Delboy’s and Nikita’s two beautiful children Layla and Brody who have been robbed of their loving father, Nathan who has lost his brother, Delboy’s nephew Jayden, and his large extended family and circle of friends,” Casey said. “We journey with the family in their great pain, loss and sadness as friend, neighbour, community. This you have done so generously and magnanimously this past week with an outpouring of sympathy, prayer, love and practical support and help. The priest said that people’s faith in God and each other is what made them strong. “Yes, we are a community that again has had to walk in darkness and in the shadow of death, but we like Derek have seen a great light,” Casey said. A light that shines, a light that is stronger than the darkness, a light that radiates healing love and drives out fear. Last night, 27-year-old Jason ‘Buda’ Molyneux was killed in a flats complex on the North Strand at about 9.45pm yesterday close to where Derek Hutch’s wake was taking place. While the Garda investigation is in its early stages, officers believe that the killing may be connected to criminal activity in the Ballymun area and is likely not connected to the ongoing Hutch-Kinahan feud. Email “Priest condemns 'reign of violence and total disrespect for human life' at funeral of murdered Derek Hutch”. Feedback on “Priest condemns 'reign of violence and total disrespect for human life' at funeral of murdered Derek Hutch”.